You are here: HomenextTopicsnextEducationnextMansfield Art College 1969 / 70. The post-sixth form students here were pursuing the one year Art Foundation Course with a view to moving on to take their Diploma in Art & Design in one of the UK’s major cities, or had not done the sixth form but instead came here direct for the two year B Tech course and (hopefully) go straight from there into the world of “design”. We ourselves didn’t differentiate between each other. The Foundation course was divided into specialist areas: graphic design, textile design, ceramics (with Bob Gallon), 3D (with Mr Morgan), and Fine Art (with Phil Muirden). The principal was Peter Johnson. It was a very dedicated and effective staff, and it was only years later I saw my tutor Phil Muirden’s work on-line and was able to appreciate how talented and respected a painter he was / is. The first photo here was taken in the main art studio. To the right of this group was the entrance to the small life-class room. To the left was the exit onto the corridor. The idiot striking a pose at the back is me, Ian Craig. 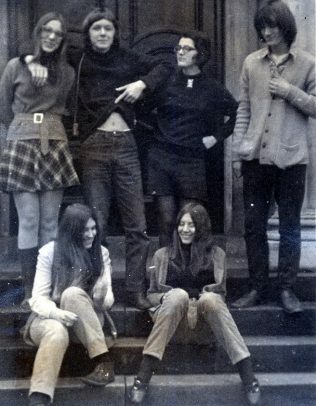 Back row standing, left to right, is Karen (known for her mini-skirts); Peter Creed (ex-Sherwood Hall with a strong Berkshire accent); Shirley (who introduced me to beat poetry); then a girl I can’t remember the name of but she had a John & Yoko style thing going on with the periscope behind; then unknown; unknown; then Angus from Scotland (very tall, arms crossed, he introduced me to The Who’s Tommy); then a member of staff in glasses who had once been a student there; then short red haired Hazel(?). Front row seated: Sorry. Can’t remember any names along this row. In the second photo the three girls on the left are Elizabeth, Karen and Shirley. Ian Craig is on Pete Creed’s shoulders. Angus is pointing down at someone’s head. The corkscrew-hair white t-shirt guy is Roger, and Heather. Apologies for names I can’t remember or got wrong. Yes, I did create a litho print of Marilyn Monroe, depicting her via two side by side photos – one of which was crossed out with a big red cross. The cross was a reproduced version of a lipstick cross she herself used edit film sheets of photos of her image, indicating she didn’t like them. I also went to John Davies Primary – but you might have known me from Huthwaite Secondary School, at the top of the hill on Barker St.
BTW David, I did check out that website of yours a fair while back and loved the work you had posted up there – but seems it is no longer working. Do you have another website, or social media outlet for your work? 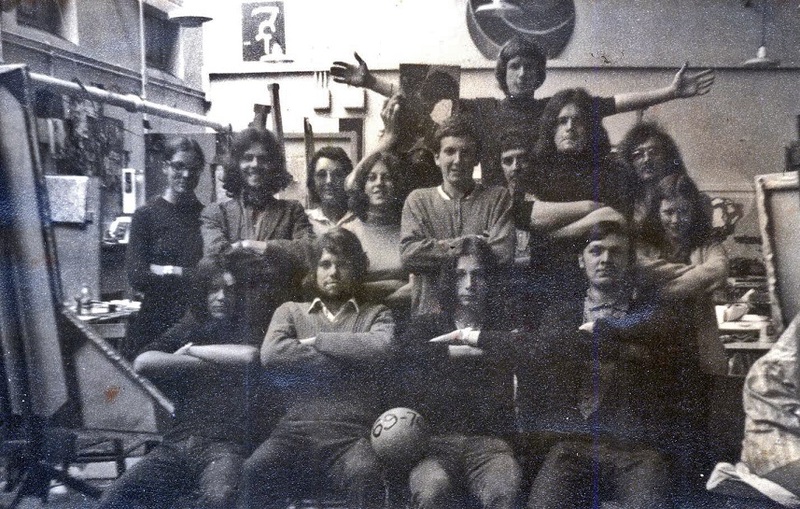 I always liked your work at Loughborough – considered it better than what most other students were doing at that time. Was one of your pictures at Loughborough a Marilyn Monroe with an ‘x’ through it? And did you go to Huthwaite School? Curious to see if my memory is still working. I reckon this bunch were the year above me when I started at Mansfield in 69. David, I also reckon that’s you in the 3rd photo. BTW, I also ended up at Loughborough where you went after Mansfield. Unfortunately that was the end of my life in art – I ended up in psychiatric nursing for 25 years. Hi Angela, and Thankyou. There doesn’t seem to be a way to go back and edit the post and put those names in, but no doubt any interested persons will read what you’ve put. In fact, as soon as I read your comment many of those names came back in a flash. I went on to teach at West Bridgford after a poor graphic design course (imo) in Liverpool. Loved teaching. Been painting my own thing now since 2006. Best wishes. 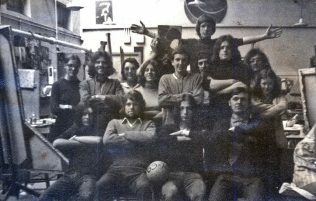 I was at the Art College 1968/69, so I remember most of these students. To fill in the gaps, the first photo, the names missing are …. member of staff was Trevor Ellis, Henry Brown is also on the back row. The red haired girl is Gail (Ledger). On the front row is Sean Askin, Maurice (Mo) Lee, Glenn and I think the last guy is David Poyser. Out of all the students here I only know of one who went on to be an artist and that was my good friend Magie (Simmons) who still continues to be creative. 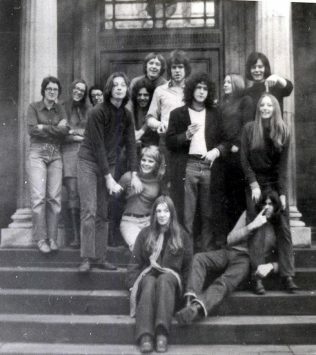 The Art College was a great place, when it was attached to Ashfield House. I was pleased to be a part of it.